This article is about the zero road distance point. For other uses, see Kilometre zero (disambiguation). "Mile zero" redirects here. For other uses, see Zero Mile. In many countries, Kilometre Zero (also written km 0) or similar terms in other languages (also known as zero mile marker, control stations or control points) is a particular location (usually in the nation's capital city) from which distances are traditionally measured. Historically, they were markers where drivers could set their odometers to follow the directions in early guide books. One such marker is the Milliarium Aureum ("Golden Milestone") of the Roman Empire, believed to be the literal origin for the maxim that "all roads lead to Rome". Argentina marks Kilometre Zero with a monolith in Plaza Congreso in Buenos Aires. The work of the brothers Máximo and José Fioravanti, the structure was placed on the north side of Plaza Lorea on October 2, 1935; it was moved to its present location on May 18, 1944. An image of Our Lady of Luján (honored on the monolith as "the patron saint of the national road network") appears on the monolith's north face, a relief map of Argentina is on the south face, plaques in honor of José de San Martín are west, and on its eastern side, the date of the decree and the name of the relevant authorities. Highways in Australia are usually built and maintained by the states and territories. In the state of New South Wales, highway distances (mileages) were traditionally measured from a sandstone obelisk in Macquarie Place in Sydney, designed by Francis Greenway in 1818. The obelisk lists the distances to various locations in New South Wales at the time. For the railway, it is located at platform 1 of Sydney Central Station. The General Post Office building in Melbourne traditionally serves this purpose in Victoria. In Western Australia, road distances are measured from Point Zero, which is by the old Treasury Building on the corner of Cathedral Avenue and St George's Terrace in Perth. Reconstruction of Constantinople's Milion, based on historical accounts and surviving fragments. The Byzantine Empire had an arched building, the Milion of Constantinople, as the starting-place for the measurement of distances for all the roads leading to the other cities. In the 1960s, some fragments were discovered and erected in its original location, now in the district of Eminönü, Istanbul, Turkey. The kilometre zero marker of the eastern origin of the Trans-Canada Highway is located in St. John's, Newfoundland. The western origin of the Trans-Canada Highway in Victoria, British Columbia, is located on the southern end of Vancouver Island. Mile zero of the Trans Canada Trail is located adjacent to the Railway Coastal Museum in St. John's, Newfoundland. Mile zero for the Alaska Highway is located in Dawson Creek, British Columbia. China Railway's 0 km is located at the entrance to the Fengtai Yard on the Jingguang Line just outside Beijing. This point was historically the start of the line; the marker is a simple concrete marker, with "0" painted on it. There is no ceremonial plaque. The kilometre zero point for highways is located at Tiananmen Square, just outside the Zhengyangmen Gate. It is marked with a plaque in the ground, with the four cardinal points, four animals, and "Zero Point of Highways, China" in English and Chinese. Cuba's Kilometre Zero is located in its capital Havana in El Capitolio. Embedded in the floor in the centre of the main hall is a replica 25 carat (5 g) diamond, which marks Kilometre Zero for Cuba. The original diamond, said to have belonged to Tsar Nicholas II of Russia and have been sold to the Cuban state by a Turkish merchant, was stolen on 25 March 1946 and mysteriously returned to the President, Ramón Grau San Martín, on 2 June 1946. It was replaced in El Capitolio by a replica in 1973. Copenhagen Town hall square is the zero point. DR-1, DR-2, and DR-3 all depart from Kilometre Zero from Santo Domingo's Parque de Independencia. Kilometre Zero in Egypt is located at the Attaba Square Post Office in 1st of Abdel Khaliq Sarwat Pasha Street, Cairo. Kilometre Zero in Ethiopia is in Menelik Square, Addis Ababa, in front of St. George's Cathedral; it is the point from which all Ethiopian highway distances are measured. The point was designated by Emperor Haile Selassie in 1930. 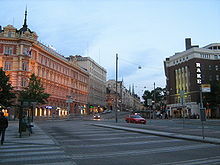 Kilometre Zero of Finland is located at the Erottaja square in central Helsinki. Plaque at the original site of Charing Cross, now the site of the Charles I statue. The term "Kilometre Zero" is not used in Great Britain. Distances from London to most parts of the country are measured in miles from the original site of Charing Cross, which is on the southern side of Trafalgar Square. In Scotland, distances from Edinburgh are measured from the GPO building in Princes Street. See also: London Stone, Hicks Hall, and St Mary-le-Bow, a church from which the distance of the original London to Lewes road is measured. In ancient Greece, distances were measured from the altar of twelve gods, located in the ancient agora of Athens. So, that altar can be considered the first kilometre zero in human history. Nowadays, the kilometre zero for Greek highways is located in Syntagma square, the major square of Athens. The Zero Kilometre in Budapest is marked by a monument, forming the number "zero". The starting point was initially reckoned from the threshold of the Buda Royal Palace, but it was taken down to the Széchenyi Chain Bridge when it was built in 1849. The city of Kecskemét also has a Zero Kilometre Stone on Kossuth Square. In India, Zero milestone is a monument in the city of Nagpur, Maharashtra. The Zero milestone was erected by the British Raj. The Zero Mile Stone consists of four horses and a pillar made up of sandstone. There is no verifiable evidence that it is a monument locating the geographical centre of colonial India in the city of Nagpur, Maharashtra, or that the Zero Mile Stone was erected by the British to use this point to measure all the distances. Kilometre zero of Indonesia is marked by the monument located in Weh Island, the northernmost and westernmost point of Indonesia. In Ireland distances from Dublin are measured from the General Post Office on the city’s main thoroughfare, O’Connell Street. For distances in Northern Ireland, Donegall Square is considered the centre of Belfast. The Italian Kilometre Zero is located on the top of the Capitoline Hill, in Rome. The Kilometre Zero of Japan (日本国道路元標, Nipponkoku Dōro Genpyō) is on the middle of Nihonbashi bridge in Tokyo. Tokyo Station is considered the originating point of the national railway network and has several posts and monuments indicating 0 km of lines originating from the station. The Kilometre Zero for the major roads radiating from Antananarivo is located on the square in front of the Soarano Railway Station. The Kilometre Zero for roads and highways in Peninsular Malaysia is located at Johor Bahru General Post Office. It is one of the rare cases where the national kilometre zero is not located at the national capital, due to the fact that the distances for three major backbone routes (Federal Routes 1, 3 and 5) are measured from Johor Bahru, where the three routes meet and connect to Singapore via the Johor–Singapore Causeway. The Kilometre Zero is located in Mexico City, next to the Mexico City Metropolitan Cathedral. The Kilometre Zero is located in Oslo at the address Observatoriegaten 1. The Panamanian Kilometre Zero is located at the Martin Sosa Bridge on the Simon Bolivar Avenue (Transisthmian Highway) in Panama City. The marble marker designated as KM 0 fronting the Rizal Monument in Rizal Park is Kilometer Zero for road distances on the island of Luzon and the rest of the Philippines. Warsaw, the capital of Poland, has a meeting point featuring plaques with distances from it to other major cities of the country. It is placed on the intersection of the city's two main avenues, Aleje Jerozolimskie and Marszałkowska Street, next to the Centrum Warsaw Metro station. The Kilometre Zero of Romania is marked by a monument located in front of Saint George's Church in central Bucharest. The bronze plaque marking Russia's Kilometre Zero is located in Moscow, just in front of the Iberian Chapel, in a short passage connecting Red Square with Manege Square and flanked by the State Historical Museum and the City Duma. Slovakia has its Kilometre Zero in Bratislava under Michael's Gate in the Michalská veža (St. Michael's tower). Seoul, the capital city of South Korea, has its 'Doro Wonpyo' (Korean: 도로원표) in the centre of Gwanghwamun Intersection to measure all distance of both national and regional roads. The initial statue, made by Seoul Metropolitan City to commemorate in 1997, is located in near of Donghwa Duty-free shop building, next to a police station, in front of Shinhan Bank building ( Gwanghwamun Station), 151 m far from its exact point. Spain has its Kilometre Zero in the centre of the Puerta del Sol in Madrid (incidentally, the clock of the old Royal House of the Post Office, in front of which the plaque is located, marks the official time in Spain, according to the urban legend). The plaque that marks this point was turned around 180 degrees by mistake in 2002 during a reform of the square. The plaque was renewed in 2009, during the roadworks of the Puerta del Sol square, and this time placed in the right position. In Sri Lanka, all distances from Colombo is measured in kilometers (formerly in miles) from the Fort Clock Tower near President's House. This practice began with the construction of the Colombo-Kandy road in 1830, which was the first modern highway in the island. Since then three major roads have been constructed from Colombo; A1 – Colombo-Kandy Road, A2 – Colombo-Wellawaya (CGHW) Road and A4 – Colombo-Batticaloa (CRWB) Road. In Sweden, the equestrian statue of King Gustav II Adolf in the middle of the Gustav Adolfs torg square in Stockholm is used as the kilometre zero for roads. In general road distance signs are measured to city midpoints. For most mainline railways, kilometres are measured from the entrance door from the main hall to track 10 of the Stockholm Central Station. There are simple painted signs on the side of the platforms. Switzerland is a decentralised country, and does not even have an official capital city. The federal railway network's Kilometer Null is located in Olten. It was made in the 19th century to mark the point from where the Swiss railway system was measured. Because of the complex and dense manner in which the Swiss railway system has since grown, and continues to grow, it is no longer used. There is a mark at Zürich main station which is located a little outside the present end of the tracks and used by some mainlines. Thailand has two points that are declared as Kilometre Zero. The National Highway's Kilometre Zero is the Democracy Monument on Ratchadamnoen Avenue, and the Railway's Kilometre Zero is the Erawan Elephant Monument, in front of Bangkok Railway Station. Zero Milestone in Washington, D.C. The metric system is not the common system in the United States, but mile markers for most major roads begin at either their western or southern terminus. The mile-marking systems are generally within individual states; the mile count starts over when a state boundary is crossed. Pierre Charles L'Enfant, the original architect of Washington, D.C., proposed an otherwise unnamed reference marker in the form of a pole to be located one mile east of the Capitol that was never built. Although not used for measurement on U.S. roads outside the city of Washington, D.C., a Zero Milestone near the White House was proposed in 1919 and a permanent marker placed in 1923 by the Federal government, funded by the Good Roads Movement. In New York City, Columbus Circle, at the southwest corner of Central Park, is the traditional point from which all official distances are measured, although Google Maps uses New York City Hall for the purpose. In the City of Chicago and some of its suburbs, the intersection of State and Madison is the defined zero point. Columna de la Paz in Montevideo. Uruguay has a "Kilómetro Cero" for the national routes at the La Paz Pillar, located in Plaza de Cagancha of the city of Montevideo. A "Kilómetro Cero" has been established for the Uruguay River by the Treaty of Río Uruguay in 1961 on the parallel passing the area, Punta Gorda in the Colonia Department, south of Nueva Palmira. ^ "Ohio Lincoln Highway Historic and Cultural Resources" (PDF). Archived from the original (PDF) on September 6, 2006. Retrieved 2007-04-22. ^ City of Sydney (2008-07-30). "History in the making for Macquarie Place Obelisk". Archived from the original on 2009-10-07. Retrieved 2009-05-09. ^ Heritage Branch (Government of New South Wales). "State Heritage Register: Macquarie Place Precinct (Draft)". Retrieved 2009-05-09. ^ "Former General Post Office". National Trust. Retrieved 27 November 2018. ^ Cathedral Square. "Point Zero". Retrieved 2018-10-06. ^ "Zero Mile". Archived from the original on 16 August 2010. ^ G. V. Joshi (2001-08-25). "Zero miles stone". The Hindu. Retrieved 2011-11-21. ^ "Menjejakkan Kaki di Tugu Nol Kilometer Sabang" (in Indonesian). Kompas. 11 February 2013. ^ "Weh Island: Diving the Untouched Edge". Archived from the original on 2015-07-11. Sabang is the capital city of Weh Island. Why not explore the town as well? You might want to take a picture of a sign bearing "Indonesia Nol Kilometer" (Zero Kilometer of Indonesia). ^ "Sabang: Indonesia at KM 0". The Jakarta Post. January 13, 2013. ^ "Peninsular Malaysian Kilometre Zero". Blog Jalan Raya Malaysia. 12 May 2012. Retrieved 12 May 2012. ^ Cai Weiqi (蔡偉祺) and Cai Wenju (蔡文居) (2012-10-07). "台灣公路原點 就在監察院前人行道" (in Chinese). The Liberty Times. Archived from the original on 2014-02-02. ^ Jacobs, Karrie (2009-04-21). "The New Time Warner Center". Travel + Leisure. Retrieved 2017-10-12. ^ Garlock, Stephanie (2014-06-27). "The Sign Says You've Got 72 Miles to Go Before the End of Your Road Trip. It's Lying". CityLab. Retrieved 2017-10-12. ^ "Kilómetro cero en Plaza Cagancha". Junta Departamental de Montevideo. 25 March 2010. Archived from the original on 29 June 2012. Retrieved 21 July 2011. This page was last edited on 18 April 2019, at 04:26 (UTC).